Particle Works – the nano- and microstructured material specialist – provides microencapsulation services for drug development applications, including controlled drug release, solubility enhancement or targeted drug delivery. Using its expertise in microfluidics and nanoparticle synthesis, the company can create bespoke PLGA formulations and coatings to alter drug release profiles, enhance the efficiency of targeted drug delivery and more precisely control dosing regimes. 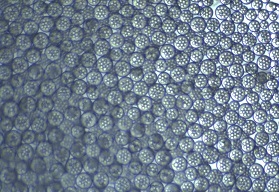 Microencapsulation of active pharmaceutical ingredients (APIs) is increasingly being employed in the drug development arena to improve the solubility of candidate drugs or protect biopharmaceutical agents (DNA, proteins, etc) from degradation, as well as to provide more controlled release of APIs over time. Functionalization of the particle surfaces with specific binding species – such as antibodies, aptamers and peptides – also allows the particles to be targeted to a specific location or tissue, increasing the efficacy of many drugs. PLGA is commonly used for drug microencapsulation, and precise control over particle size, shape and architecture is extremely important to the efficacy of the candidate drug. Particle Works can use its expertise in nanoparticle development to improve the targeting efficiency, distribution and lifetime of the particles in vivo. From the encapsulation of candidate APIs in custom PLGA configurations to the creation of unique functionalized coatings, the company can provide high quality development and scale-up of highly monodisperse nanoparticles (typical CV values of <5 %) offering improved targeting efficiency, efficacy and reproducibility.